Amazing trek across the two Berber valleys of the High Atlas Mountains leads from Imlil to Setti Fadma via Tizi n'Tacheddirt (3600m) and Ourika valley. 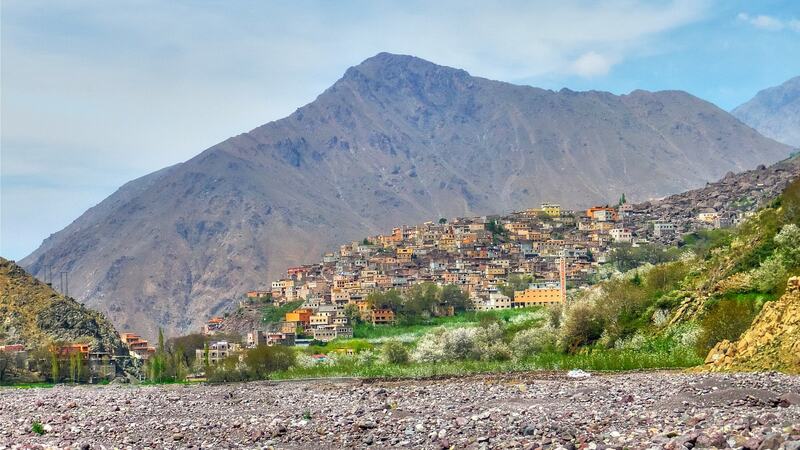 The altitude allows great panoramic views over the Toubkal National Park. Walking along the ancient houses made of mud and stones catching the glimpse from the lives of locals. The valleys are linked by gorges and constant proves of human presence shaping the environment – terraced fields with vegetable, walnut trees and apple orchards belonging to every village. With a bit of luck, in the Setti Fadma region you can come across monkeys, which are currently on the verge of extinction. After a transfer to the village of Imlil (1740m) about 65 km south from Marrakech where our trek will start. Here we meet our mule team and set out on a two hour uphill hike to the tizi Tamatert (2279) to the large village of Tacheddirt (2314m) where we stop for the night. Approx. 4 hrs walking. There is some climbing today but this is largely a day of descent as we head down the valley towards Timichi. We start with a climb of about 2 hours up to 3200m before gradually descending for a further 2 hours towards Iabbassen (2030m), a favorite picnic spot. After lunch we continue along the valley to Timichi, an old Berber village where we spend the night in a Berber home. Approx. 5 to 6hrs walking.